What good is that smartphone in your pocket when the touch screen is too difficult to use or the buttons are too small for your fingers? We all love our mobile gadgets, but as they get smaller it gets harder for some people to manipulate the input and displays. 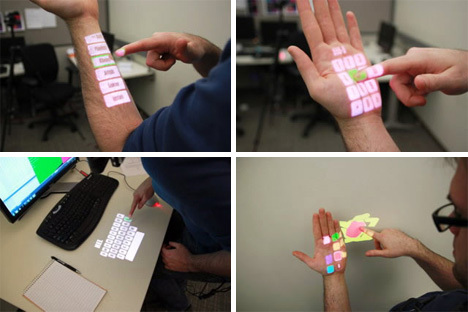 Chris Harrison’s OmniTouch is a wearable mobile device that would turn any surface into a touch screen, making it possible to interact with the environment in totally new ways. The OmniTouch consists of a wearable pico projector and a short-range depth camera. The projector creates a graphic interface on walls, books, tables, hands or basically anything else in the user’s vicinity. 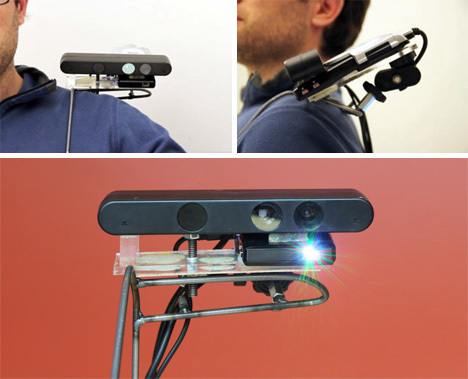 The camera can detect whether the user is manipulating the interface with one or more fingers, and whether those fingers are hovering above the surface or “clicking” on the virtual interface. 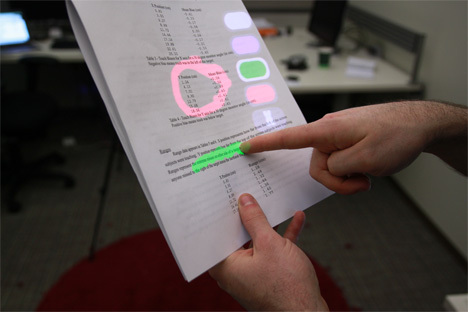 During tests, the interface performed about as well as mainstream touch interfaces already in use today. Users don’t need any special training or detailed instructions to use the device, and surfaces wouldn’t require any preparation to be used as impromptu virtual interfaces. The video above shows various uses of the interface, and they are all completely amazing. According to Harrison and his research partners, the system could distribute functionality intelligently – for example, it could use the hand as the color pallette and a wall as the canvas for a painting program. Unlike most other novel touch screen prototypes, this one looks simple to use and intuitive: just what we want in a brand new type of interface. See more in Phones & Mobile or under Gadgets. November, 2011.